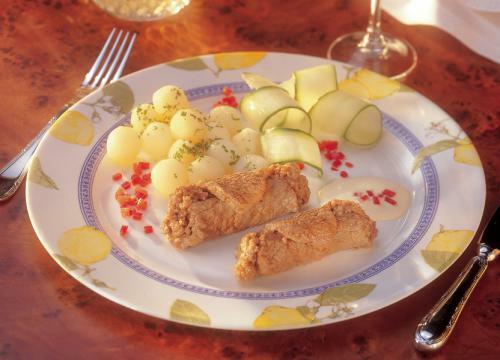 Sprinkle the veal escalopes with salt and pepper and spread with tomato puree on the inside. Mix the veal mince with salt, pepper, ½ a tsp. paprika powder and possibly a few breadcrumbs. Divide the mince into 4 rolls and place 1 on each escalopes. Roll up the escalopes and fasten with a thread. Peel and finely chop the shallots. Melt the butter and sauté the shallots. Remove from the pan and set to one side. Add the veal rolls to the pan and brown quickly on all sides. Remove from the pan. Add the flour and the remaining paprika powder to the butter and fry until golden brown. Add the wine, stock and cream and stir well until the sauce thickens. Add the shallots and the veal rolls. Halve the red pepper, remove the seeds and seed pods and finely cube the flesh. Stir half of it into the sauce. Serve the dish sprinkled with parsley and the rest of the red pepper. Serve with boiled new potatoes and cucumber salad. * Add a slice of raw ham between the escalopes and the mince roll. * Add asparagus tips or mushrooms to the sauce.